Modern log homes are an expression of what building with wood has achieved. 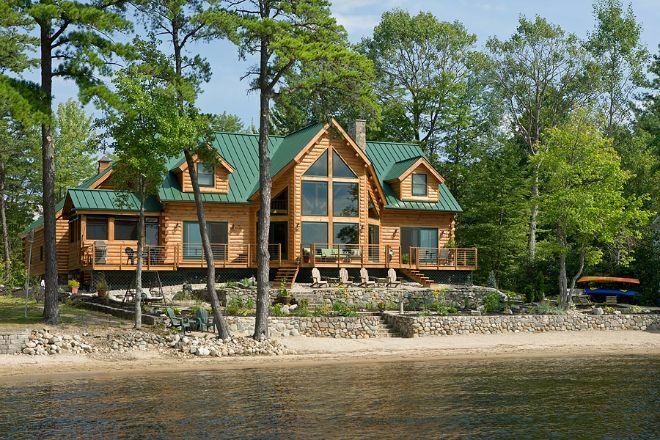 Often a far cry from the hardened lifestyle of a traditional log cabin in the wilderness, modern log homes manage to capture the contemporary American home life yet maintain the charm of living in nature, surrounded by wood. What an inviting building! 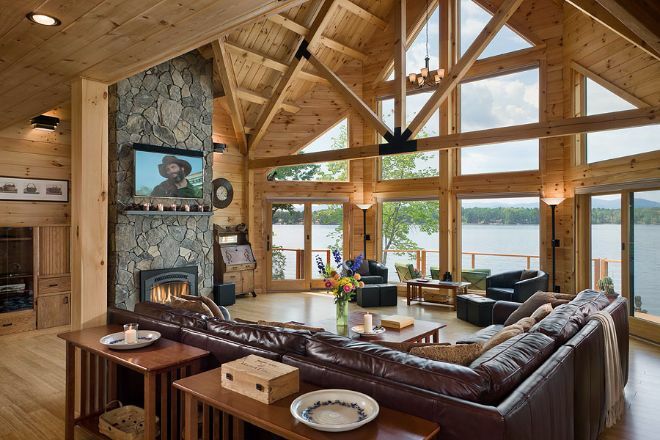 This stunning log home has a facade of wood and glass, which makes for an attractive appearance but will also serve to draw the natural surroundings into your home. What a delight! Inside the great room, we can see how the floor-to-ceiling windows and gentle arc of the prow create an impressive panorama of the lake. High-quality finishes are prevalent throughout this very spacious living room, with the exposed timber beams an attractive addition to space. The natural stone fireplace is an inviting option for cozy evenings, and will easily heat this lofty home. The kitchen in the Lagios boasts the high-quality finishes we have seen since we first stepped foot into this wooden abode. With all the charm of a country kitchen, the cooking space in the Lagios has all the functionality of a contemporary home, yet maintains the rustic charm of a log cabin. The open-plan great room is completed with a designated dining area which could easily house a large family table. Sliding glass doors lead to a wide porch making dining al-fresco very simple. 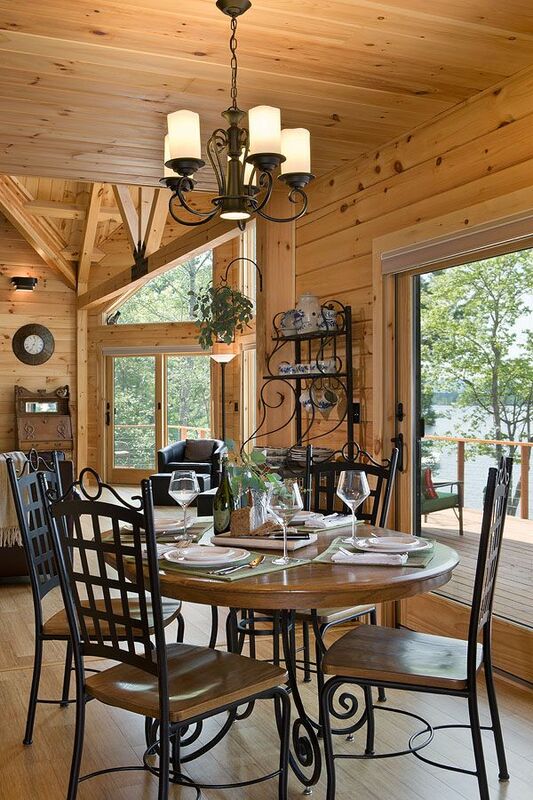 Imagine lunch overlooking that lake – dreamy! The ground-floor master bedroom shares the fireplace with the great room, meaning you are heating your sleeping space during evenings by the fire. 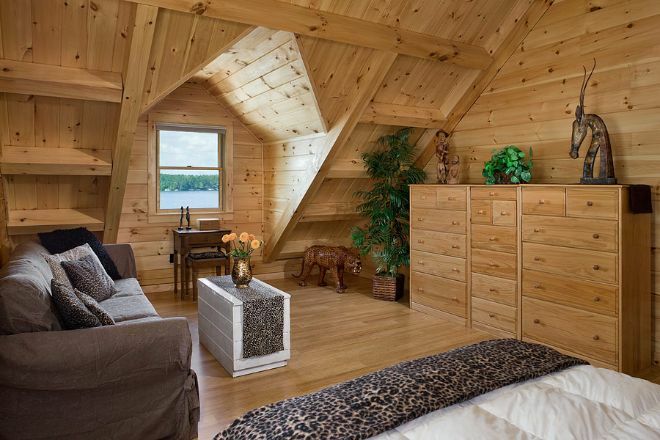 This spacious bedroom can easily house the rugged furniture which perfectly finishes a log home, and benefits from direct access to the front deck and the master bathroom. The spacious loft is open to the great room below, benefiting from the large windows of the prow front. 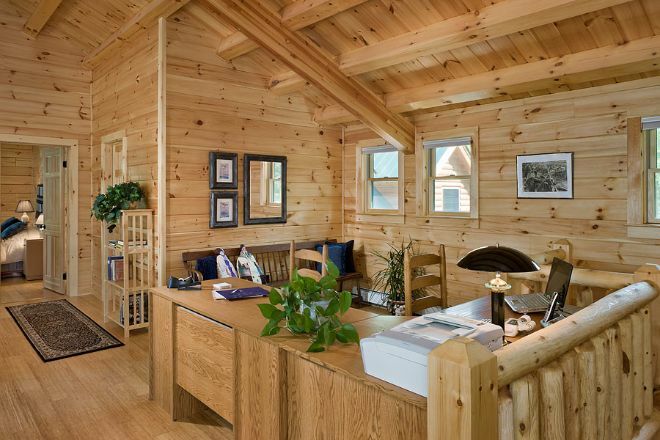 The loft is a large room in itself, and could easily be adapted into a second sitting room or, as pictured in this example, makes the perfect home office overlooking the lake. The upstairs of Lagios features two more bedrooms, both larger than the master bedroom downstairs, but with a shared bathroom. 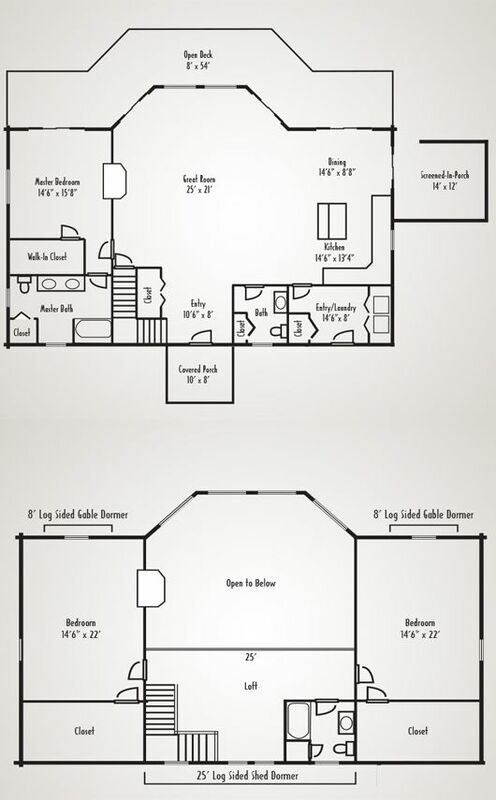 All three bedrooms in this floor plan have walk-in closets and plenty of space to live, not just to sleep. You can see from the floor plan below how this house forms to create a fantastic use of the 1,872 square feet (173.9 square meters). Lagios is a perfect log getaway, do you agree? LIKE and SHARE on Facebook. An exclusive cabin with a timeless rustic charm. 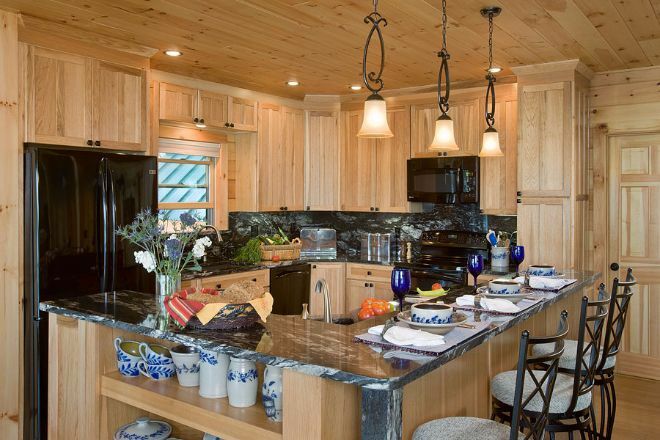 This modern log cabin was constructed by esteemed builders, Expedition Log Homes.